Bite Me Fine foods is family owned producer in Sth Gippsland Victoria, producing Organic Vegan Falafel and Veggie Burgers sourced locally from Certified Organic producers. Our products are all Gluten free, nut free with no preservatives. We believe that life is for living.No one wants to miss out on their favourite treats while chasing their health and fitness goals. Don't worry, we've got you. 100% Natural. Free from Refined Sugar & Preservatives. No added Dairy, Eggs or Flour. Feeling the heat? Bruno Gelato is like no other. It is the antidote to heat, a fresh & frosty respite from the searing summer sun. Bruno Gelato is 100% natural, locally owned & environmentally aware. Our gelato is produced in a small factory in Dromana on the Mornington Peninsula. Our produce is sourced locally fresh everyday and we use St David dairy for our milk and cream based products. We are Melbourne's first food truck for dogs. Dedicated to providing street food to your canines, raw healthy meals, beers & treats for canines. Like all good things, Cavalier Brewing was born over a beer. 100% independently owned and operated by three mates who founded the company in 2011. All of our beer is un-pastuerized, unfiltered and contains no artificial anything. Cider Tonic is a prebiotic immunity booster, that has all the benefits of ACV, PLUS any benefits the additional 16 ingredients that it is steeped in may impart. Our ingredients include amazing anti-inflammatory foods such as raw honey, turmeric, ginger & garlic. Crisp Produce & Preserves is the heartfelt enterprise of Simone Lukacs, a long time vegetable gardener, home orchardist and preserve maker. Amy and Matthew from Cobb Lane Bakery sell their delicious artisan breads and pastries every week at The Fitzroy Mills Market. All of their products are made by hand, using traditional methods and locally sourced ingredients - organic and sustainable where possible. They love creating classic products with a unique modern twist and believe in all things tasty! 100% vegan deodorant + anti-chafe balm. Natural | Chemical free | Effective. We have created a healthy alternative chocolate range packed with super nutritional components to boost the body’s health. Delicious Raclette and Grilled Cheese Sandwiches from Harper & Blohm are a must when visiting The Fitzroy Mills Market. Every dish is made with carefully selected melted Victorian cheeses, Dench Bakery organic sourdough, and the odd seasonal vegetable from local stallholders. Come to The Fitzroy Mills Market every second Saturday to sample Harper & Blohm's menu... they never disappoint! Small batch granola. 100% Humble. Handmade in Melbourne. Refined sugar-free. Crunchy as hell! Lilac and the Cat is Melbourne's most ethical, eco-friendly florist. Our Studios are located on the outskirts of Melbourne city. We're on the constant look out for locally sourced flowers and we hand deliver them, with love, across all of Melbourne— oh yeah....and we are in total lurve with what we do! Increase your circulation, mobility and alignment. Handmade cheese from Victoria’s High Country. Proudly family owned and Milawa made. Commitment to flavour, sustainable farming and a passion for quality ingredients. Makers of delicious low-carb, grain/gluten free paleo breads. Developed, made & tested by a coeliac & type 1 diabetic who are on the wellness path! Offaly Good Food focuses on product quality, using mainly organic, local ingredients to create our nutrient dense and offaly good pâté. Each jar is handmade in Melbourne with 100% ethical and sustainable ingredients. We cook and seal each jar with organic coconut oil, making our pâté gluten and dairy free. We are owner/operators of sea farms in the Portarlington area. We harvest a range of shellfish (Mussels/scallops) along with the aquaculture and wild harvest (under permit from Fisheries Victoria) of seaweed species such as Wakame, Sea grapes and Australian Kombu. A new way of drinking & thinking is here! We're on a mission to help people become healthier and healthier. Diego and Georgia produce the most delicious, award-winning organically fed (soy free) and free-range eggs. Come to The Fitzroy Mills Market this Saturday to grab your pack of eggs for that special Sunday brunch! Meet Anna! She owns and runs Plains Paddock Farm. The welfare of her animals is the number one priority and Anna goes to great lengths to ensure that her sheep receive the best possible care from the day they are born. Come to the market to buy your free-range Plains Paddock Dorper Lamb and seasonal beef! Permaculture, Education, Arts, Community and Enterprise (PEACE) are the four pillars upon which PEACE Farm operates. This organic community farm is situated in the fertile valley above the ancient banks of the Yarra River in Yarra Junction. Creating delicious almond bread made with fresh, simple ingredients you'd find at home, for everyone to enjoy. Four flavours....Gluten Free....Hand-Home made! Keep an eye out for some new products coming soon! Kakadu Plum Co celebrates and honours traditional Australian culture and bush foods. They offer Kakadu Plum Powder, Lemon Myrtle, Wattleseed and Bush Tea! A family-owned business producing top quality, Gluten Free and vegan baked goods. Be sure to come and try these delicious sweets without the guilt! Jesse and Jesse from Enki Organics produce handcrafted essential oils, therapeutic body care and herbal remedies using ingredients they grow themselves. Their gardens & workshop are located in Daylesford, Macedon ranges and they use local UV filtered mineral water as a base in all of their products. Their production is centered around artisan distillation, beyond organic, permaculture gardening & traditional herbal medicine. Come visit Jesse and Jesse this Saturday at The Fitzroy Mills Market to get your beyond organic essential oils and face/body care products. Our favourite is the "Fountain of Youth" facial treatment! The award-winning PINK MUESLI is the first and only vegetable muesli in the country. It harnesses the health benefits of beetroot in a delicious crispy cereal. Raw and dehydrated to retain every bit of goodness, PINK MUESLI is a multivitamin mix of premium ingredients sourced from local organic farms. It is guaranteed to brighten up your breakfast bowl, your salads, your desserts, giving you a nutrition boost. Five varieties will be on offer with free tastings to help you choose. So try something unique and give them a hot pink go! Organic bone broths and sauces • Nourishing • Nutrient dense • Gut healing • Gelatin rich • Paleo friendly • We love your guts. Three Bears was started by high school best friends, Ben and KP. With Ben's background in marketing and KP's nutrition degree, they decided to start a business which combines a love of porridge with a passion for social change. We donate 100% of our profits to Eat Up Australia, an organisation feeding the 1 in 8 Australian kids who arrive at school hungry every day. We make and sell artisan oat inspired creations using local and seasonal produce - porridge in the winter and bircher & granola in the summer! At Weyhill Farm, we're about growing great garlic naturally. Then sharing it with fellow fresh Aussie-grown food lovers around the country, for a reasonable price of course.We love growing garlic and creating garlic products, so we hope you enjoy our range of garlic goodies. Family business using locally grown produce to make our cider 100% natural from branch to bottle! Mark Wood has been growing and packing apples in Harcourt for the past 18 years. Come to The Fitzroy Mills Market this Saturday to try his Gala, Fuji, Pink Lady & Sundowner apple varieties. You can also try his family sized apple pies, apple cider, apple cider vinegar and fresh, unpasteurised apple juice. Chai Addict & Chai Harder is a chai tea concentrate handmade in Melbourne with an emphasis on flavour, consistency and sustainability. The masala chai concentrate is unsweetened and vegan friendly, made from certified organic spices and certified organic Ceylon tea. Made in small batch brews, ensures the authentic taste and flavours are consistent throughout the process. The ingredients used are composted at local community gardens which is then used to feed the vegetable plots to close the sustainable loop. We collaborate with local producers who inspire us, are masters of their craft and who uphold similar beliefs and practices as Chai Addict. Our aim is to supply great quality meat direct to the public and we want our animals to live life as naturally as possible. I am the farmer, and there is nobody else between you and me. We specialise in authentic Indonesian tempeh production in Melbourne area and they say we’ve got the BEST in town! Non-GMO Organic Australian Soybeans. We hand craft nut butters that taste exactly how nature intended. Delicious / Ethical / Irrepressible. Made in Australia. We are a small regenerative no-till organic farm nestled into the hills of Main Ridge, Mornington Peninsula. We grow according to the seasons and work as hard as we can to bring the earliest available seasonal, organic vegetables and honey to our customers. We also invest a significant amount of energy into education and reaching out to young potential farmers eager to learn the art of growing. In this way, our presence at a market is about sharing the goodness of organic food, and sharing the possibilities around creating a better food system for us all. Gavarnie Olive Oil began as Olive oil producers and expanded their products to include caper bushes because of their location in the hot and dry climate of the Victorian Pyrenees - well suited for their cultivation. They have 200 caper bushes, which produce capers and caperberries from December to March each year. They are all hand picked, daily during this period. As there are not many capers producers in Victoria and Australia, they believe they can provide a unique produce for your market visitors. From extract brewing in our garage to a large commercial setup, as a father and son we have been brewing beer in one way or another for the better part of 15 years. Our bond has been strengthened by our mutual passion and the love of good quality Australian beer and our fury beer is no exception. So why are we called 'Fury and Son'? Well if you are brave enough you can ask Reno when you see him! Dalia makes vegan, vegetarian and gluten-free nourishing meals. Her menu includes a variety of vibrant salads, dips and traditionally prepared falafel! Eat Dalia’s amazing food at the market, or take it with you for a nutritious meal at home! Kimu offers authentic family-based dishes, blending Japanese and Korean food with big and bold flavors. Their healthy rice bowls are made with fresh produce sourced directly from local Victorian farmers. Kimu is fast, fresh, healthy and above all…delicious! Who is Plant Pasta? We are a new Plant Based Pasta Company! Our pasta is hand made fresh in small batches using organic CHICKPEAS. Because we believe chickpeas are nutritionally better for you. Our pasta has double the protein/fibre than wheat-based pasta. But more importantly it tastes good too. Our pasta is also Gluten Free, Vegan and Natural with no gum binders and additives. Lithia Springs is a family owned and run olive grove producing high quality organically grown extra virgin olive oil. The olives are hand harvested and locally pressed. Frantoia, along with a mix of other olive varieties, produces a distinctively fresh and lively olive oil with a characteristic peppery flavour and with a grassy aroma “verde”. Amelia creates 100% beeswax coated wraps and bags used for food transport and storage - without any nasty chemicals! She also sells soaps and skincare products made from natural ingredients, beeswax candles and bath bags made with herbs from her garden. Come to The Fitzroy Mills Market this Saturday to treat yourself or that special friend with one of Amelia's beautiful and pure offerings! Beat the post-Easter sugar hangover with The Good Seed's powerful probiotics! Made in Mornington Peninsula of Victoria, The Good Seed brings you a range of probiotic sparkling water kefir. The age-old recipe is designed to nourish the body from inside out, made with local, organic ingredients. Shimon’ (a.k.a the red trailer) is Melbourne’s first and only food trailer serving authentic 100% Vegetarian and Vegan Israeli falafel. These falafels are homemade, using LOTS of fresh herbs, Middle Eastern spices and locally sourced Chickpeas and Fava Beans. These 4th generation fisherman are passionate about supplying fresh fish and seafood to Victorians, caring for our oceans, educating the public about our precious ecosystems and running their amazing sustainable fish farm. The flavour and quality of their fish will not disappoint! Get ready for one of the world's most amazing superfoods...WALNUTS! Boonderoo Walnuts is a primary producer of natural and artisan walnut products. Come to The Fitzroy Mills Market this Saturday to try some walnuts and learn all about their amazing health benefits. Meet Jolie, our new self-taught macaron baker! Jolie's main focus is on quality ingredients, freshness, sharp flavour profiles and making her own jams and fillings from scratch. Come down to The Fitzroy Mills Market this Saturday to try her mouthwatering works of art! Alice from Gelato by Alice is passionate about making gelato! She creates a range of gluten-free, sugar-free, vegan, lactose-free and conventional flavours, which are inspired by her asian heritage, traditional ingredient combinations, and by the requests of her loyal customers. Some of our favourites are the hojucha tea flavour, the matcha flavour and the cacao with cacao nibs! Three generations of passionate bee keepers from the Spranger family produce deliciously raw honey (Heidi Honey) from their very own beehives, famous chai tea to nourish the soul, and natural beeswax candles to warm up any home. Don't miss out on this amazing opportunity! Karolina is of Swedish and Danish heritage and is passionate about sharing the best parts of the Nordic culture, food and design. Her passion project, So Nordic, is essentially a Scandinavian hub for food, design and lifestyle! Tomorrow at The Fitzroy Mills Market, she will be offering Scandanavian-style open sandwiches on a rye bread base with different toppings such as: cured salmon, roast beef with horseradish, and potato/tomato with chives. Karolina will also be offering small intricate design items such as vases, ceramics, candle holders and candles - all following the Scandinavian minimalist theme. We can't wait! We just can't get enough of our new trader's delicious treats! Berliner Berliner - meaning 'Doughnut Doughnut' in German - produce a tasty range of doughnuts with vegan options available. All of their doughnuts are made from scratch and with locally sourced ingredients. They even make their own version of Nutella! Come to The Fitzroy Mills Market this Saturday to take some home before they're all sold out! Meet John and Amelia from Piece by Peace Desserts! They make delicious baked and raw vegan desserts in a variety of flavours. Come to The Fitzroy Mills Market this Saturday for some guiltless vegan doughnuts and "cheesecakes". We can't wait to try them! Kooinda Brewing Company began as the first residentially licensed brewery in Australia. With growing interest in their brand, the brewery has now grown into the notable powerhouse it is today! The team only uses the best ingredients to create a range of beers that are flavoursome and satisfying. Come try some this Saturday at The Fitzroy Mills Market! Meet the new kids on The Fitzroy Mills Market block...The Little Mushroom Co. Bryan and Maria create decadent and healthy vegetarian fast food. They offer a range of mushroom burgers with gluten free options that will tempt even the most passionate meat lover! There is a reason why they have a cult following in Melbourne...they are that good! Did someone say gluten free cannoli? Dom and Kate from Eat Cannoli handcraft the most delicious, gluten free, artisanal cannoli using only the best ingredients! They have several flavour sensations including a delicious Vegan option while still maintaining the integrity of this traditional Italian sweet! Come to The Fitzroy Mills Market this Saturday to watch Kate freshly pipe and decorate these scrumptious masterpieces! Eat Cannoli was born as an idea between Dom & Kate as they thought of the foods they loved best and evoked the memories of holidays had with family back in Italy. Dom with over 18 years experience as a Chef and Kate with a passion for style . We just can't get enough of Eat More Granola's amazing olive oil-based granolas! Tian will be at The Fitzroy Mills Market this Saturday showcasing her seasonal blends of delicious and healthy granolas. Our favourite is the Original mix, which includes almonds, coconut, pumpkin seeds and more! #drool! Meet our brand new awesome traders, Fabrizio and Christina. They are passionate about creating the drool-worthy, world renowned classic Italian dessert...tiramisu! This is prepared by them on the spot following their traditional Italian recipe and served from a vintage Italian three-wheel car. You can choose from the following flavours: Original Classico, Nutella, Oreo, Matcha Tea, Salted Caramel, White Chocolate and Coconut, Bounty, Snickers, Chilly Dark Chocolate, Strawberry and for those with dietary preferences, they offer Gluten Free and Vegan options. What's the one thing you've really missed at The Fitzroy Mills Market? More free range and organic fresh meats! Every Saturday, John from Taradale Meats will be bringing organic whole chickens, free range chicken fillets and organic lamb, so come have a chat to him about his wonderful offerings and delicious recipe ideas. Ashley began her wonderful organic herbal tea business in between working as a nurse and studying naturopathy. Trying to tackle the old excuse of "I am too busy to be healthy", Ashley used her health knowledge to create a range of organic herbal teas that can be used on-the-go to foster a blissful sense of calm and wellness. Some of her amazing tea flavours include: Digestive Ready, Sleep Well, Post Chow Down, Immunostrength and many more! Ben from La Villa Salumi is back this week with his mouth watering gourmet free range sausages and smoked meats. His amazing sausages are made as they should be - with only pork, salt, spices and herbs. No preservatives, gluten, rice, rusk or fillers are included, and his sausages are hand tied using natural casings. We can't get enough of his Canadian-style bacon, smoked American-style franks and Mexican-style chorizo. None of his meat has been frozen, allowing customers to freeze at home if they desire! Sarah from Caye Life has created a range of functional and sustainable water bottles – all BPA and toxin free – in a fun range of colours and textures, designed to suit all personalities and occasions. The insulated design means they’ll keep your drinks chilled for up to 24 hours, or nice and warm for up to 12 hours. Danny’s Farm is a small-scale regenerative farm comprising of a small herd of cattle (Angus, Julia & Pebble), a small flock of chickens and ducks, and two exceptionally charming dogs (Bryn and Tash). It is situated on rich & fertile volcanic paddocks just outside Daylesford, Victoria. Danny's mission is to provide delicious, seasonal meals and reconnect people with their food, the farmers who produce it and the delectable taste of fresh local produce. Come to The Fitzroy Mills Market this Saturday to try their Portuguese tarts, Chocolate and almond brownies and Goats cheese, cherry tomato and rosemary tarts.  Get ready for a burst of fresh produce at The Fitzroy Mills Market! Dominic will be brining you succulent fruits and nutritious veggies every week. He and his family are passionate about fresh and delicious produce, so come see what they have on offer this Saturday at the Market! Meet Georgina! She is a passionate maker of small batch, unique and vegan jams, pickles and preserves. All of her recipes are tried and tested and are made at home from start to finish! Come to The Fitzroy Mills Market this Saturday to try her mouth watering Chilli Jam, Onion Jam, Mint Jelly, Cucumber Pickle, Nam Prik Pao (Thai Chilli Paste) and Tomato Relish. If you're looking for that special treat for yourself or a friend, a delicious cupcake made with the best quality ingredients is the way to go! Baking Workshop is a Melbourne-based cake studio launched in early 2017, specialising in buttercream flower cakes, custom cakes and desserts. Their mission is to deliver enjoyment with the finest ingredients and designs. Baking workshop now also offer traditional and vegan banana bread, which has quickly become a favourite healthy treat within The Fitzroy Mills Market Team! Law and architecture students, Alex and Matilda, have completely memorised us with their beautiful flowers. They locally source flowers from their good friend's farm near Meredith and turn them into the most wonderful bouquets! Come and buy a bunch to brighten your home this Saturday at the market. Are you sick of overly-sweetened and chemically-laden iced or sparkling teas? You're in need of Bloom Sparkling! Stefan creates organic sparkling bottled teas that are fun to drink, with pure ingredients that each serve a functional purpose to boost vitality! He uses no concentrates, extracts or nasty sweeteners in his sparkling teas, so make sure to give them a go this Saturday at The Fitzroy Mills Market! The story of The Nut Pantry began when owner Emilie started experimenting with nut butter recipes at her home. After perfecting some flavours, she began selling to friends and family, which led to The Nut Pantry taking off as the flourishing business it is today. Emilie makes delicious classic nut butters with a twist! Her nut butters only contain natural ingredients without any added oil, preservatives or nasty sugars. Come to the Market to try her mouthwatering flavours: Cinnamon Peanut Butter with Walnuts and Honey, Pecan Peanut Butter, and Cacao Almond Butter with Hazelnuts. Yum Treats is made up of three wonderful women with a passion for pets and making people smile! They offer treats for humans (peanut brittle), and baked and dehydrated dog treats, with no preservatives, salt or sugar - all made from locally sourced ingredients. They also sell glamorous dog coats, collars, leads, and bandanas, as well as bags and purses for owners that are all locally designed in North Fitzroy. Come treat your doggy (and yourself) this Saturday at the Market! The team at The Fitzroy Mills Market is so honoured to collaborate with Crepes for Change - a 100% non-for-profit social enterprise making delicious crepes to alleviate youth homelessness through hospitality, entrepreneurship and employment of vulnerable young people. Crêpes for Change (now rebranded as Society Melbourne), direct 100% of their profits to funding projects that work to alleviate youth homelessness through rental subsidy schemes and hospitality training programs for young people. We could not be prouder of these guys and can't wait for you to try their mouthwatering crepes! We are very excited to introduce Penelope from NutButterMilk and her unique product! Penelope makes a nut milk concentrate made from unadulterated raw local nuts. Simply pump a portion into water, shake and...viola! You have fresh, homemade milk - no straining or blending required! Penelope believes that her NutButterMilk has the smallest ecological footprint, and is more delicious and decadent than any other milk on the market! Convent, ethical and...delicious! Laetitia from Pain et Chocolat is a chocolatier with a French accent and a deep love of chocolate. Pain et Chocolat was born out of Laetitia's childhood memories from France - a small bar of chocolate eaten on a warm slice of bread, or in a piece of baguette as an after school snack. The business began with six flavours of chocolate bars, made with Felchlin single origin couverture chocolate from Switzerland. The range has now grown a little bit with new flavours and new products like larger bars, mendiants and chocolate dipped dehydrated apples. Laetitia sources only the highest quality local ingredients (organic when possible) to make her mouthwatering chocolate. Come to the Market this Saturday to sample her yummy range! If you're suffering from a bad case of the munchies, then you'll love our brand new traders, Bianca and Farren from Curiously Cauli! These real food heroes celebrate the humble cauliflower with their cauliflower dips and cracker range! Their crackers are naturally low in fat and sugar, and are also gluten free, sugar free, nut free, preservative free, vegan friendly and 40% lower in carbohydrates compared to market leaders. Curiously Cauli Dips are also gluten free, sugar free, vegan friendly and contain no artificial colours or flavourings - just real ingredients. To say that the team is ecstatic about having Curiously Cauli at the Market is a complete understatement! Meet Duncan and Dom - two mates and Horticulturalists who run Melbourne's only Plant truck. Their business is a completely walk-in, mobile indoor plant nursery run out of a 1968 International Harvester horse float and a 1950's Wayfarer caravan. They sell a range of indoor plants and cacti, along with pots, hand made macrame hangers, ceramic pots, terrariums and other botanical accessories. What started as an idea over morning tea has now completely taken over their weekends! Small Numbers is a bakery with a focus on beautiful, local and unique ingredients such as Australian natives, freshly milled wholegrain flours and unrefined sugars. They make a range of sweet and savoury pastries using modern techniques to create simple but interesting baked goods. Originally from South Australia, Charlie moved to the U.K. and trained in several Michelin star restaurants before returning back to Australia to become the head pastry chef at a leading bakery in Melbourne. Since Charlie loves building strong relationships with his customers, he was very keen on being part of The Fitzroy Mills Market and getting to know all of the locals that buy and love his pastries. Golden Plains Honey is located in the small town of Teesdale in Central Victoria, about one and a half hours from central Melbourne. It is a family owned small business that produces 100% raw and cold filtered delicious honey - with absolutely no heat applied during extraction or processing! Golden Plains honey is fully matured and cured in the hive, which are all chemical free and sourced from sustainable Australian timber. Biodynamic principles of beekeeping ensure optimal conditions for the bees, which maximises bee health! These real food legends also work closely with local farmers to promote bee health and bee-friendly practices. Come to The Fitzroy mills Market this Saturday to try their amazing raw and cold filtered honey and beeswax products!